A superstar team of Pattaya’s best marching band students will represent Thailand at a well-known European band festival in July and try to qualify for the world championships. 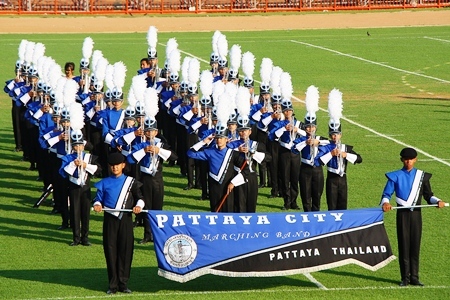 The “Pattaya Marching Band,” one of two teams that mix students from Pattaya’s 11 schools, will play in Germany’s Rasteder Musiktage International Open July 7-10. The concert, parade and show is an official qualifying competition for entry into the 2012 and 2013 World Association of Marching Show Bands World Championships. Musicians in the Pattaya Marching Band are lined up and ready to give their award winning performance. Pattaya Mayor Itthiphol Kunplome recently honored members of the Germany-bound group, as well as a second Pattaya-based team that took second place at the National Sports Games in Chonburi in January. At a Feb. 24 ceremony, the mayor presented musicians and their teachers with certificates and plaques. The road to Germany began for the students in October at a contest in Nakhon Nayok where Pattaya students took home 20 gold, 16 silver and 14 bronze medals. Itthiphol said well-known band instructor Theerapomg Photiwet has been hired to lead the international team.